For those times when you just want to get on the web quickly to answer emails or look something up, the C720 is ideal. Google Chromebooks have always been a bit of an outlier, appearing on the scene as tablets surged and netbooks faded away. Fitting somewhere in between these two niches, they offer quick and easy internet access for those who prefer a PC-style interface to touchscreen tablets. Google's Chrome OS, however, doesn't offer the full range of possibilities provided by a laptop running Windows, MacOS, or Linux. Compared to the HP Chromebook 11, the Acer C720 ups the ante in terms of horsepower while maintaining the Chromebook's attractive features. Its simplicity of use, small-and-light form factor, and $249 price tag make it an ideal client for web browsing. There's a lot to love about this system, but a few things that feel inadequate. 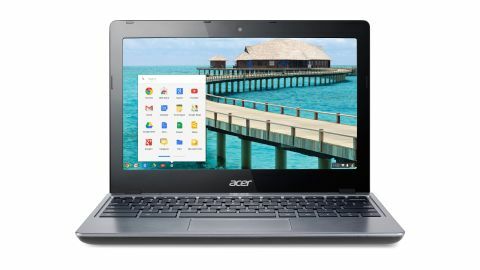 With its low price and mammoth Haswell battery life, the Acer C720 is one of the best Chromebooks you can get for the money. While it might be robbed of flagship status by the cute styling of HP's effort, and it lacks the dense display of the MacBook Pro-style Chromebook Pixel, the C720 nicely exhibits everything you can, and cannot, do on a Chromebook. The C720 features an Intel Celeron 2955U CPU running at 1.40 GHz. Using the Haswell micro-architecture and built on a 22 nm process, this 64-bit CPU features two cores and 2 MB of cache. Acer has coupled it with 2 GB of DDR3L SDRAM. It also features Intel HD Graphics running at a 200 MHz base frequency and 1 GHz max dynamic frequency. That is more than enough processing power for anything the Chromebook is designed to do. It might even be a bit of overkill for the very light-on-its-feet Chrome OS. Your standard benchmarks don't have much relevancy to the Chromebook user since these machines aren't designed to run traditional applications. Look elsewhere if you want to use Photoshop filters, do video editing, or play 3D games. Chrome OS is designed for simple office tasks and Web-based applications. For these low-intensity uses, the system is more than powerful enough. It's extremely responsive, and since the operating system is so streamlined, it often will do these tasks even faster than a souped-up Windows PC loaded down with the extra baggage typical of many installs. Ever done a fresh install of Windows on an old PC and seen how much faster your PC ran? Think of Chrome OS as a PC that's always running a fresh install. Using Chrome OS takes some getting used to both conceptually and practically. Pretty much, a Chromebook is a laptop that runs only one thing: the Chrome web browser. There's a beautiful simplicity there, especially since the web browser monopolizes so much of what most people do day-to-day on their PC. That simplicity has some great benefits. Boot up is extremely fast. It takes as much time to type in your password as it does for the system to boot up. It feels more like sleep/awake than a true shutdown and bootup process. This is impressive compared to other notebooks, but of course, Chromebooks aren't the only Internet appliance which can offer this feature. Tablets offer similar speed-of-access. Chrome OS is also tightly connected with a Google account. There is a guest mode, but to make full use of the system, you need a Google account. This personalizes the experience and lets you have a similar experience across platforms. For instance, your bookmarks travel with you, as do the files available on your Google Drive. Another cool feature is the "powerwash" reset which returns the notebook to the original factory state. This complete wipe takes just a few minutes and gives you a fresh PC. Any user can perform it, though, so it's best not to leave valuable files stored locally only on a Chromebook.